The picture above is an iron garage door we recently installed for a resident of San Francisco.This iron garage door is arched with a unique scroll design backed with plate glass and bronze highlighted scroll work on the panels. Though this house isn't large, it's in the heart of this cultured city and their garage door is on display for all to see. It's the first thing everyone sees as they drive by and our customer is now turning heads with these long-lasting doors that are insulated and durable as well as beautiful. 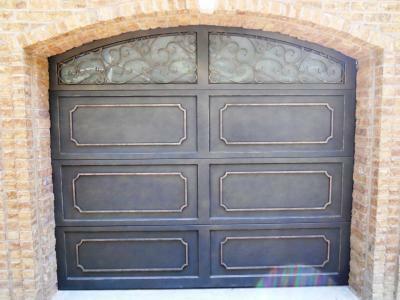 Our iron garage doors are unique to the market and the team here at Signature Iron Doors would love for you to visit our website and contact us to see how we can help you find the perfect iron garage door for your home.